On a slightly random note - do you guys think it's OK to thin out matte topcoat with normal polish thinner? I'm not sure exactly why I'm wary about it, but one of my bottles of Matte Magic is in a bad way, and I'm just hesitating. I suppose I'll end up doing it eventually, and seeing either way - since it will be as useless gooey & thick as it would be if the thinner wrecks it LOL. this is so pretty (as usual). i'm not sure if you can thin out the matte coat. maybe you can experiment in a small mixing plate. let us know how it goes. I have thinned my Matte About You with regular thinner, and it works great! This is one beautiful pink holo. 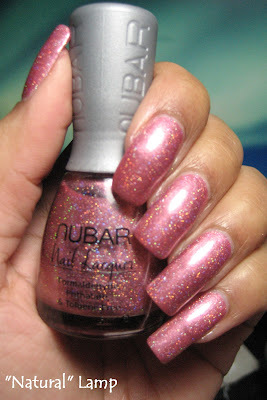 Love Nubar. Glad that someone answered your question about the Matte Magic. Mine hasn't thickened yet.